Here's how to help ensure that your living Christmas tree will thrive for years to come. The best strategy for keeping your living Christmas tree alive and well is to keep it cool and well-watered and to limit the amount of time it spends indoors. Here's how to help ensure your Christmas tree will be around next year. Buy early. Most nurseries will tag and hold trees until you're ready to bring them home. Put the tree in a transition zone. Two weeks before Christmas, put the tree in a garage for about a week to allow for acclimation to an indoor environment. Keep it watered, but don't overdo it. Move the tree indoors. A few days before Christmas, move the tree to a spot with filtered light, but well away from drafts and heater vents; a cool location is best. Be sure it gets all the water it needs. Limit the size of bulbs. Christmas lights don't pose a serious threat to plants; depending on the types of lights and how you use them, however, they can cause some minor damage. Large bulbs can create enough heat to actually burn leaf surfaces, so use only light strands that come with tiny bulbs. Move the tree back to the garage. A few days after Christmas, put the tree back in the garage. No matter what, don't leave the tree inside the house for more than a week to 10 days. Plant the tree outdoors. If the ground freezes in your area, consider digging the planting hole in the fall and covering it with leaves. Otherwise, just dig your hole, add amendments to the soil if necessary, plant the tree and water it well. 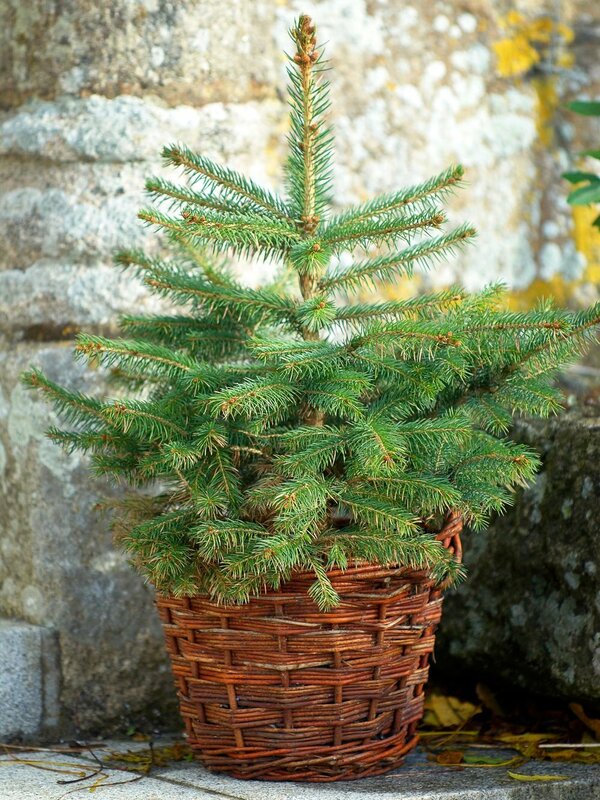 Make sure potted trees are in pots large enough to provide some insulation from the cold, and keep them watered well.